Our over-sanitized world threatens children's health, but parents can change their environment into one where they'll thrive. Babies and young kids are being raised in surroundings that are increasingly cleaner, more hyper hygienic, and more disinfected than ever before. As a result, the beneficial bacteria in their bodies is being altered, promoting conditions and diseases such as obesity, diabetes, asthma, allergies, and autism. 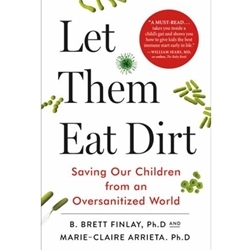 As Let Them Eat Dirtshows, there is much that parents can do about this, including breastfeeding if possible, getting a dog, and avoiding antibiotics unless necessary--and yes, it is OK to let kids get a bit dirty.